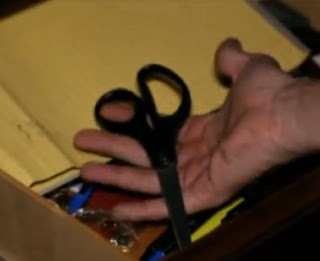 DHS-approved scissors should be enough to stop a gun-toting madman. If you need more evidence of the idiocy that is running rampant among the ruling elite in Washington, consider this recent "training" video from your friends at the Department of Homeland (In)Security. The purpose of the video is to demonstrate "possible actions to take if confronted with a (sic) active shooter scenario" (an office building in this case) and review "the choices of evacuating, hiding, or, as an option of last resort, challenging the shooter." It is assumed that you won't be "challenging the shooter" with a gun because, well, you're too stupid and irresponsible. Guns are for those wearing government-issued costumes, not mere civilians. Besides, if you have access to an arsenal of office supplies, like scissors, staplers, rubber bands, and sticky notes, why on earth would you need a gun? The DHS title is "Options for Consideration Active Shooter Training Video." However, I think a more appropriate title would be "How to Be a Victim and Increase Your Chances of Dying." Which brand of scissors do you recommend for self-defense? ...Are Scotch brand any﻿ good, or should I spend extra and get Fiskars? The video didn't specify if I should attempt to stab the gunman or throw the scissors at him and run away. I'd like your advice. Thanks! Citizens: Because you aren't allowed to defend yourself you must cower in fear and﻿ try to escape. Scissors will probably be the most effective weapon you will have handy. Abandon your wounded friends and walk toward the huddled together group of police dressed in black that have assault weapons you can't own while keeping your hands up. Do exactly as they say and don't walk too fast or make any fast motions because they might kill you. Once outside thank god for DHS. DHS, you're pathetic. Since carry's legal in 49 (soon 50) states, failing to address the possibility of sheepdogs among these sheep is irresponsible. "If a colleague is armed, avoid being behind his target. Be sure you help him get a clear shot at the guy we're suggesting you use﻿ scissors against, in order that your obituary can at least claim you were brave against sadly overwhelming odds." Good grief, DHS. Everyone run, hide, or die until your armed betters show up. Pathetic. Ignorance is bliss. Don't read.